during practice for the Monster Energy NASCAR Cup Series Advance Auto Parts Clash at Daytona International Speedway on February 9, 2019 in Daytona Beach, Florida. Three Monster Energy NASCAR Cup Series teams will be without their car chiefs for the remainder of Daytona (Fla.) International Speedway Speedweeks that will culminate in Sunday’s Daytona 500. The ejections are results of multiple pre-qualifying inspection failures Feb. 10. Greg Ebert, car chief on Austin Dillon’s No. 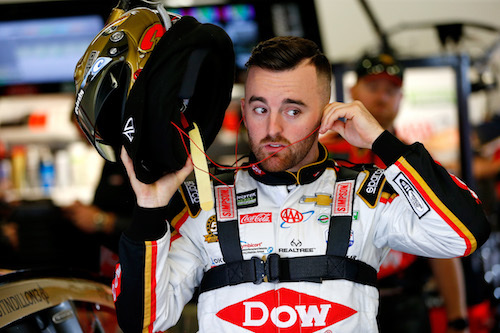 3 Richard Childress Racing team; Billy Plourde, car chief on Ty Dillon’s No. 13 Germain Racing team; and Josh Kirk, car chief on Chase Elliott’s No. 9 Hendrick Motorsports team were ejected from the DIS garage area after their cars failed pre-qualifying inspection twice. All three passed on their third attempts. The teams also will be docked 15 minutes of practice time this week. Three more practice sessions are scheduled between Friday and Saturday. Hendrick Motorsports drivers William Byron and Alex Bowman claimed Daytona 500 front-row starting spots during the two-round, single-car qualifying session. The remainder of the race starting grid will be determined after two Gander RV Duel races Thursday night. The Daytona 500 is scheduled for Feb. 17.